A motorhome and campervan hire is the best way to enjoy a relaxing drive in Tasmania. Book a camper or RV rental in Hobart with VroomVroomVroom to save time from browsing different websites. We compare deals from major suppliers such as Britz, Jucy Rentals, Apollo, Stardrive, Maui and Real Value, and through us you can also hire a car in Hobart. Hobart is a city with a lot of natural, cultural and historical attractions to offer. Whether you plan on exploring the markets in the city or taking a road trip through some of the beautiful national parks, a campervan hire can get you where you need to go. Before you start your journey, it is a good idea to check the traffic situation. Will you be driving in Australia in winter? In Tasmania there can be frequent snow fall. Check out these driving tips to make sure you are fully prepared. It is children friendly and is at the start of the Coal River Valley wineries, near the historic town of Richmond. The park's campsite facilities include a 19 hole mini golf course, barbecue facilities, camp kitchen, car park, conference facilities, WiFi, cots, playground, restaurant and tour desk. The site is safe and secured. Its campsite facilities include a barbecue area, beach volleyball court, children's playground, conference facilities, faxing facilities, golf course, Internet access, laundry facilities and parking spaces. Historic Richmond, Salamanca Market, Sullivan Cove, Port Arthur and Tasman Peninsula are all nearby. The park's campsite facilities include a barbecue, camp kitchen, car park, courtesy transfer, communal kitchen, communal refrigerator, cots, high chair, iron, public telephone and laundry ideal for people travelling in a campervan. It lies in the southern region of Tasmania and is in proximity with the Bonorong Wildlife Park, ZooDoo Fun Park, Coal River Valley wineries and the main village street that homes historic buildings, restaurants, galleries and shops of Richmond. The venue has powered and unpowered sites for camping and campervans. Its campsite facilities include a barbecue, camp kitchen, car park, communal kitchen, recreation room, kiosk, playground, swimming pool and a half size tennis court. 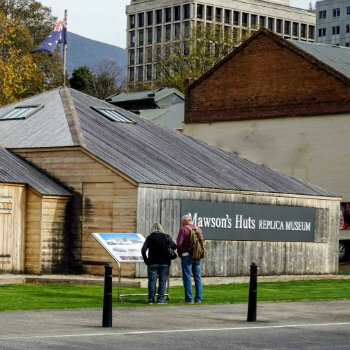 Mawson's Huts Replica Museum is situated on the beautiful waterfront of Hobart just across Mawson's Place and Constitution Dock. Also known as "The Gateway to Antarctica," visitors can see a replica of the historic huts built by Dr. Douglas Mawson and the other members of the Australian Antarctic Expedition. The museum is open daily from 9am to 6pm (October 1 to April 30) and from 10am to 5pm (May 1 to September 30). Bonorong Wildlife Sanctuary is a beautiful Australian wildlife sanctuary that was founded in 1981. The venue is home to a wild range of wildlife, taking care of any sick or injured animals. Visitors will get the chance to see the site's beautiful wildlife and to pet, cuddle and watch feedings of Tasmanian devils. Salamanca Market is open every Saturday from 8am until 3pm in historic Salamanca Place. The market is very popular among both locals and tourists. The Salamanca precinct has a number of restaurants, cafes, galleries and the market itself has over three hundred stalls that sell just about anything from fresh produces, fashion items, snacks, jewellery and more. It's an ideal venue for any shopaholics. Mount Nelson Lookout offers a wonderful panorama of Hobart city and the Derwent River. It can be reached by car via Nelson Road. Having breakfast at the restaurant within the lookout is highly recommended, especially for those who wish to do something romantic and relaxing. Royal Tasmanian Botanical Gardens can be found at Queens Domain, Hobart close to the central business district. It was founded in 1818 and covers over 13.5 hectares of land, abundant with beautiful plants. Aside from its beautiful gardens, the area also offers a restaurant that serves very tasty food, a botanical shop, guided tours and wide range of gardening activities and classes. Tasmanian Devil Conservation Park lies along Arthur Highway in Taranna just 10 minutes from Port Arthur. This unique wildlife park is an 'un zoo'. That means that the visitors are those in pens and the famous Tasmanian devils run free. View them from custom built pods and tunnels. The park is open every day from nine in the morning until five in the afternoon and offers low admission charges, especially for children and families.